Signs & Symbols What do the Satanic Hand Signs mean? The devil "horned hand" is modernly and typically known as a mark of allegiance with evil forces, whilst in ancient times the hand sign was used to ward of the "evil eye" by emulating the horns of the devil. 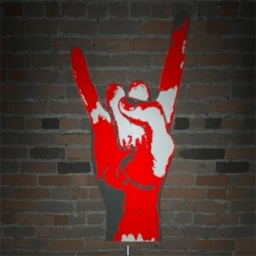 Deep research, however, on the origin of the "goats horns" hand gesture will lead you to a more spiritual meaning. The hand sign that you see being thrown about by high profiled personalities are known as "Mudras". This Sanskrit word is derived from the verb mud, meaning "to please," with the inference being that the Gods are the ones that are being pleased. It also means "seal,""sign," or "mark." Mudras are hand signals, but with a more sacred nature. They have spiritual meanings not only because of their intention, but because each part of the hand and the fingers is dedicated to a diety. Mudras are used in yoga and dance as well as in religious pictures and statuary. When used in yogic practices, Mudras not only help to focus the mind on abstract ideas and the intention behind the pose or asana, but experts say that the movements themselves have a direct connection to the nervous system and can help with breath control, etc. each of the five elements: the thumb is space, the index finger is air, the third finger represents fire, the fourth water, and the little finger earth. Some universally accept gestures have their origins in these sacred signs. 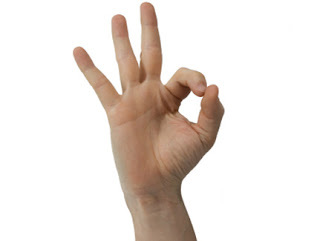 For example, in Chin Mudra is effectively the same as the "OK" sign, symbolic of approval, or "all is well," some even relate it to the "all seeing eye." Here, the tips of the index finger and the thumb close in a circle. The other three fingers are straight Because in Hindu belief the thumb represents the universal spirit, the circle made when the finger touches is symbolic of the self that meets the universe, making a circle of completion or wholeness. Another mudra that is known universally is the Anjali Mudra or the Namaskara Mudra. Again, westerners will recognize this as a gesture of prayer, both hands together at chest level. The touching palms represent the connection of spirit and matter. The gesture also seals and contains energy. Often accompanied by a bow, the word namaskara, or namaste, means "i bow to you." So what do you think about all the influential people who use these signs? Are they using it correctly or is it something else all together ?